Ben (Jeff Groff) is a young man who’s having a rough time of it. His thoughts turn to his younger sister Trish (Amber Morgan), mixing together moments from their childhood together, as well as their young adulthood. 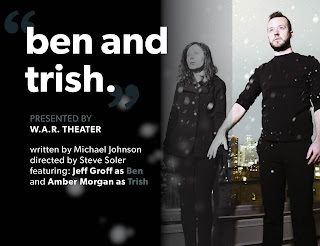 The play and the production seem to indicate that Trish committed suicide by taking a lot of pills. Ben’s mental quest seems to be trying to determine what drove Trish to take her life, and how exactly Ben failed her and wasn’t there in her hour of greatest need. Director Steve Soler gets strong performances out of both of the actors here. Despite the dark framework of the story, there’s a lot of lightness and humor scattered among the more serious material. 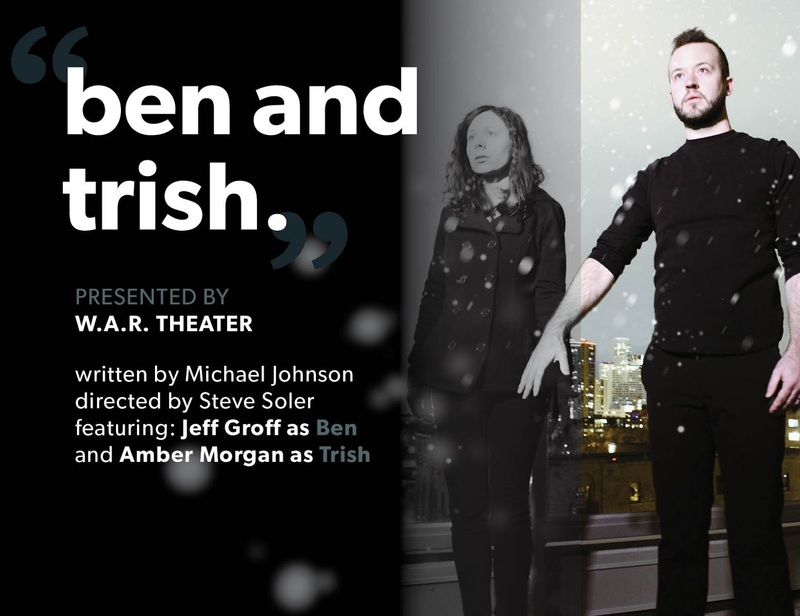 Groff and Morgan are great at embodying the children Ben and Trish used to be, and equally good at shifting back and forth between child and adult on a moment’s notice. There isn’t a set to speak of in the Springhouse Ministries’ sanctuary. The actors are clad in black. The lighting by Sami Dee is very simple but effective (with a lot more levels of light and shadow than I expected were possible in this space). A lot of it comes down to just the two actors and the script creating the world, which they do quite impressively. There is also the regular presence of live music, composed and performed by Zachary Briscoe on percussion, and Elliott Heerman on guitar. The music is also cleverly used to provide a smattering of sound effects throughout the story. The trick here is that there’s an abrupt and unexpected turn in the story about three-quarters of the way through the run time, which I won’t spoil here. But it has the effect of throwing the whole play up to that point, as well as after that point, into question. And I’m not entirely sure why the storytellers thought it was necessary. It doesn’t seem like a great strategy to undercut all the good work of world and character building, not to mention audience connection, you’ve done up to this point, just for the sake of saying “Ha ha! Twist! Bet you didn’t see that coming!” No, I didn’t. But I’m not sure what you just gained by doing that. Because now you have not one but two unreliable narrators, and I’m not inclined to believe anything they say, good or bad. So how do you get to any kind of a satisfying ending at that point, light or dark? Then there’s the whole “manic pixie dream girl” problem. Not that Trish is in any way meant to be an incestuous love interest for her brother. But Trish serves a lot of the same functions as a manic pixie dream girl. She really exists only in her brother’s imagination and memories of her. She is not a fully autonomous character with her own needs, wants and agenda. She exists to serve Ben. She exists to set his mind at ease, let him off the hook for her death, and get him to embrace living his life again. Which is all very well and good, but a little self-serving for both Ben and the playwright. As compelling as Morgan is to watch in the role of Trish, she’s kind of been written into a corner, even before the twist but even more so after it. The whole thing leans pretty hard on the idea of the audience never questioning white male privilege. Ben's problems are the real problems. His suffering is the suffering that really counts. His redemption is meant to be the play’s happy ending. Given everything we learn about Ben, does the guy even deserve redemption? I’m not saying a play can't still exist and be satisfying in that territory, but I think it should probably be a little more aware of how and why it’s doing it. I’m not sure the production of ben and trish. is. ben and trish. might want to be a tribute and reclaiming by a brother of the memory of his sister, but right now it’s not quite doing it. Mostly because we end up not being sure what’s real and what isn’t. In its current form, the story doesn’t really need to be ninety minutes, because at about the one hour mark, the transition back and forth from child to young adult starts to lose some of its punch. We’re not getting any new information at this point that helps us deepen our understanding of either of the characters or their relationship to one another. The tactic itself also isn’t showing much in the way of variation. And while innocence lost as a subject packs a lot of punch, we see a lot of their innocence, but not a lot of specifics about how exactly they lost it. More of the latter would make better use of the extra running time.